The loose dogs of Istanbul are usually tagged (on the ear) and many wear collars or bandanas. They are so tame that you can feed them from a spoon. This one with the arctic eyes only liked the hotdog pieces (much like other dogs I’ve met). 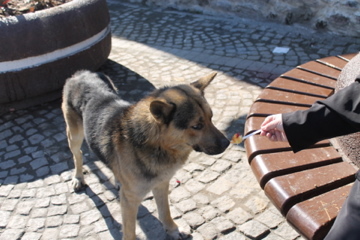 Yes Turkish stray dogs are very gentle and love human interaction. Great picture.